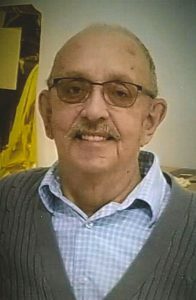 Age 77, of Lansing, MI, passed away January 29, 2019. He was born June 26, 1941, in Lansing, to Donavon and Velma Volker. Gary delivered food to campus dorms at MSU for 36 years. Faith was very important to him; he and his wife were members of Messiah Lutheran Church. He absolutely adored spending time with his grandchildren, loved gardening and taking care of his lawn, and he enjoyed adult coloring books. He is survived by his loving wife of 50 years, Elaine Volker; children, Kevin (Michelle) Volker, and Kelly (Jose, Jr.) Villarreal; grandchildren, Brandon (Halley) Volker, Morgan Volker, and Taylor, Nicole, and Jose Villarreal III; and his aunt and cousins. He was preceded in death by his parents, his baby brother, and stepfather Robert Knowles. The funeral service will be held at 1:00 p.m. on Tuesday, February 5, 2019, at Messiah Lutheran Church, 5740 W. Holt Rd., Holt, with visitation one hour prior. Interment will take place in Deepdale Memorial Gardens. His family will receive friends from 6-8 p.m. on Monday at the Estes-Leadley Greater Lansing Chapel. Memorial contributions may be made to his church. 40 + years that we’ve known each other.. We’ve missed our outings to dinners with you and Elaine , so many open houses and banquets . We’ve had so many laughs and fun together. We watched you two have your twins ,then they grew up ,we attended their weddings ,the quinceinera of your granddaughter how wonderful it was ……. You are sorely missed already. We said prayers for the repose of your Godly soul and that God to embrace you and welcome you in to His kingdom , His loyal and faithful servant. Gary was a strong Christian man and did sou have for Messiah Lutheran Church and its members. I still remember sitting and talking with him at the new members meeting; such a friendly guy. We rejoice he lives with his Lord. Gary you will be so missed. With a friendly smile every Sunday and your laugh could be heard through the church joking with Tom. We will miss you and rejoice that you are with our Lord and Savior..
Elaine & family, we are so sorry to hear of Garys passing, I can still hear his laugh; he was such a sweet & thoughtful man. I’m certainly not sorry for Gary, can we only imagine what he is experiencing now with Jesus, how glorious. But Elaine my sympathy goes to you, hugs and kisses to you. I am so sorry for your loss! Gary was such a wonderful man, always helping where needed… but not for glory or recognition. He was a true servant of God. I will miss our talks… when he would come into work & help you in the kitchen. He was a blessing to all who knew him! I feel so lucky to have had you for my cousin. I remember meeting you at the bus stop and walking back to the house. I enjoyed those times and so wish we had not moved so far away. I know you are in a good place and do not have to go through all the pain. I know you are with your mom and dad and others that you love. We will miss you. Hi Gary, I will certainly miss you. We’ve known each other since 1968. I remember back then when we were on a men’s bowling league at Westlawn Bowling Lanes. Lots of good times then. And I really enjoyed working with you over at Our Savior Lutheran School. I am very happy that you are now pain-free and being in the presence of our Lord. Elaine Volker and family ,So sorry of Gary’s passing and is so missed . We’ll try to be at the services, but I too am with failing health in my declining years … I will try hard to Hug your sweet family at one of the services ,if I cannot do it ,my legs do not carry me very well these days …Know I loved you like a brother and I love you still ,we’ll be together again one day. We are so sorry to hear of Gary’s passing. May you find comfort in knowing that he is resting in the arms of Jesus.